One Piece is celebrating the 20th Anniversary of the anime series this year, and fans of the series have been looking back fondly on just how far Luffy and the Straw Hats have come over the 20 years time that best opportunity to do so has come in the form of the viral "10 Year Challenge" in which an image from 2009 is compared to 2019 and shows how much the subject has grown. 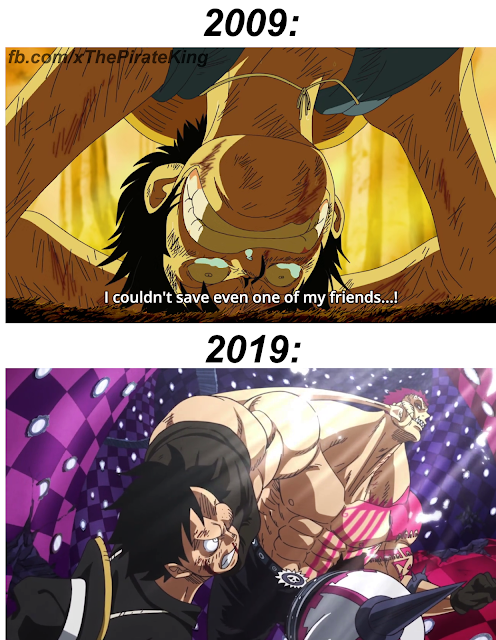 It's a stark contrast when you put 2009's Luffy to 2019's Luffy too, as shown by the viral image. In 2009, the anime was putting Luffy and the Straw Hats through their most dangerous challenge yet that Arguably the biggest event in the series so far, as it set the stage for the coming time-skip, the Sabaody Archipelago Arc saw Luffy and the Straw Hats utterly defeated by Kuma, the Pacifistas, and Admiral Kizaru that Before we found out that Kuma was actually saving the Straw Hats from destruction by warping them away. This brought Luffy to one of his lowest points in the entire series as despite how hard he fought, he too was defeated and unable to save any one of his allies from Kuma's grasp. Ten years later, the Straw Hats are stronger and doing better than ever. While they are currently being chased by Big Mom, they have managed to hold their own against one of the Yonko, which is something fans would have never guessed would happen ten years ago.